When temperatures drop below freezing, take extra care when letting a dog outside. Time spent outdoors should be limited the lower that temperatures drop. According to the manager of the Burlington County Animal Shelter, Jackie Dennis, in freezing temperatures, dogs should be outside only as long as it takes for them to do their business and then let back in the house. If an animal needs to be outside for any stretch of time, make sure they have proper shelter — something raised off the ground with the opening facing away from the wind covered with a burlap or plastic flap. The shelter should be small enough to retain body heat but big enough that the animal can maneuver. “They need to be able to stand up, turn around and lay down. It depends on the size of the dog,” said Dennis. Animals tend to show signs of distress not unlike their human counterparts when they have been exposed to cold for too long. According to Dennis, lack of movement and shivering are the clearest signs an animal needs to be brought inside. “The kinds of things you see when you’re watching the ASPCA commercials and you see them sitting there cold and shivering, it’s the same thing,” said Dennis. The age of an animal should be taken into consideration as well as the breed. Very old or very young animals are more vulnerable to cold temperatures. The breed of an animal determines the thickness of their fur, which also plays a role in how much exposure they can safely take. Some breeds are made for the cold and some are not. 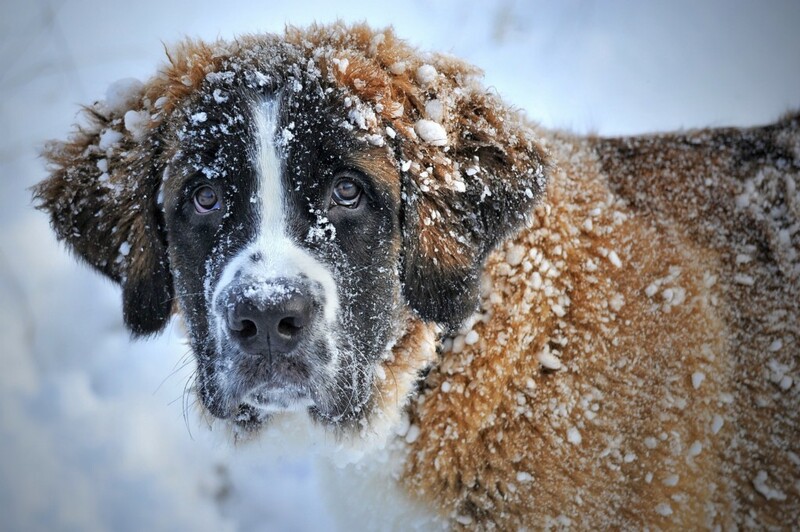 “There are cold breeds like huskies and Saint Bernards that can take the cold a little more. They can be out a little longer, but I still don’t think they should be kept outside,” said Dennis. If your animal has drinking water that is kept outside it needs to be checked and refilled to prevent dehydration. A bowl of water will freeze quickly in low temperatures. Winter can turn your regular walks with your animal into a bit of a minefield. Keep a close eye and make sure your animal does not drink from any puddles as they can be filled with antifreeze or other melting chemicals that can be toxic for pets. Dennis also suggests wiping off your dog’s paw pads after coming back from a walk as they can pick up rock salt from the sidewalk. “It irritates their pads and they can get really sore, it’s not pet friendly salt and if they have a cut it’s really going to hurt” said Dennis. Stray cats have been known to take shelter under a warm car engine in the winter. If your car was run recently, take an extra minute before driving off to knock on the hood which should be enough to scare off anything hiding beneath.